We are a small family foundation, founded by Henry Alexander, brother of Judith Alexander, in 2005. We come together, having been inspired by the uniqueness that was Judith, with a dedication to keeping the spark of her spirit active in the world. Our heartfelt desire is to inspire and engage our community by promoting and supporting Georgia artists and arts organizations and to aid in extending the understanding of the importance of art in our society to future generations. While Judith was supportive in myriad ways to many artists, her primary focus in later years was on the artist Nellie Mae Rowe. Judith insured a lasting legacy with her major gift of 130 pieces of Nellie Mae Rowe's work to the High Museum of Art in Atlanta, and through the establishment of a permanent, rotating display there. We are devoted to sustaining that legacy. 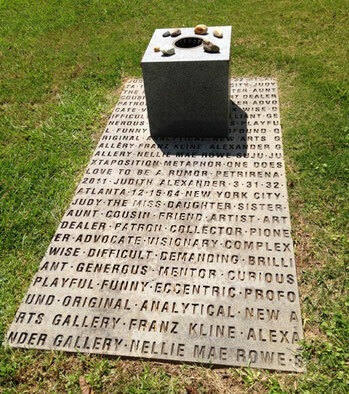 Above: Memorial at Crestlawn Cemetery, Atlanta, GA, designed by artist and friend Mario Petrirena. Nellie Mae Rowe and Judith Alexander. Photo by Lucinda Bunnen. 1979. Embellishment by Nellie Mae Rowe.